Richard Gere and Susan Sarandon (Shall We Dance?) 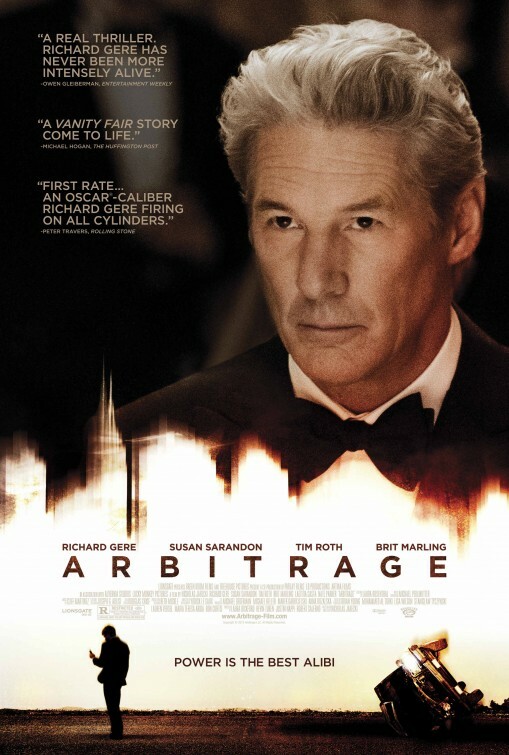 reunite in the corporate thriller Arbitrage written and directed by Nicolas Jarecki. Arbitrage is a financial term for trading in different international currencies simultaneously and taking advantage of the price difference in two or more different markets. The central character of silver haired seducer Robert Miller superbly played by Richard Gere in a 2013 Golden Globe nominated performance, certainly does that as a duplicitous New York hedge fund manager. Not only does Miller have a lovely wife Ellen and two Ivy League educated children, but he also has a sultry and demanding French mistress, an emerging art gallery owner played by Laetitia Casta. Arbitrage opens with Miller jetting into New York to celebrate his 60th Birthday and what appears like a perfectly successful life goes horribly wrong in the course of the crisply edited film as Miller’s life unravels after a tragic car accident in which he seeks assistance from the paroled son of a former Miller Capital employee, Jimmy Grant played by Nate Parker(The Secret Life of Bees) in what appears as a Bonfire of the Vanities scenario. Miller is in the process of negotiating the sale of his hedge fund company, Miller Capital to a buyer to cover the cost of a Russian copper deal which went south, a fact that he is desperately trying to keep from his CFO (Chief Financial Officer), his headstrong daughter Brooke Miller, wonderfully played by Brit Marling. When Brooke discovers the multi-million dollar discrepancy she confronts her father and in a tense scene played out in Central Park, Miller tells his daughter that he is the patriarch and that he did what was best for his family. Brooke’s glowing estimation of her father as the corporate breadwinner is surely diminished. If audiences are expecting the rich to pay for their sins, naturally this does not happen in Arbitrage as it brilliantly portrays a powerful affluent family who is devoid of a moral core, a ruthless patriarch who will do anything to retain his wealth as well as his social status while protecting his family. In this respect Richard Gere is superb and in the penultimate scene of the film, the confrontation between husband and wife, Gere and Sarandon do not disappoint as the power couple whose infidelities and lies are covered up by shrewd corporate dealing and malignant marital complicity. For at the end of the day, the Millers like any extremely wealthy family who are accustomed to trading with millions of dollars on the stock market will do anything to protect their privileged position, no matter the means to which they ascended the cut-throat culture of venture capitalism as embodied by Wall Street and New York’s power elite. Look out for a great performance by Tim Roth (Pulp Fiction) as determined detective Michael Bryer who knows that Miller is responsible for culpable homicide but cannot get past the shady hedge fund manager’s brilliant cover up. Arbitrage is an intelligent stylish financial thriller similar to Wall Street devoid of any moral core, which makes it all the more frightening considering the long term global repercussions of the 2008 financial crisis as experienced five years later.